The last thing Jamie Watson wants is a ruby scholarship to Sherringford, a Connecticut prep school just an hour away from his estranged father. But that's not the only complication: Sherringford is also home to Charlotte Holmes, the famous detective's great-great-great-granddaughter, who has inherited not only Sherlock's genius but also his volatile temperament. From everything Jamie has heard about Charlotte, it seems safer to admire her from afar. From the moment they meet, there's a tense energy between them, and they seem more destined to be rivals than anything else. But when a Sherringford student dies under suspicious circumstances, ripped straight from the most terrifying of the Sherlock Holmes stories, Jamie can no longer afford to keep his distance. Jamie and Charlotte are being framed for murder, and only Charlotte can clear their names. But danger is mounting and nowhere is safe - and the only people they can trust are each other. Charlotte is exactly what you would expect from a Holmes. She's wildly unpredictable, terribly moody, and borderline sociopathic. Jamie is exactly what you would expect from a Watson. He's loyal to a fault, tolerant beyond understanding, and the calm in the storm. When a fellow Sherringford student is discovered murder on campus, Holmes and Watson are the first suspects - but they're also the best chance to find out what really happened. It's the kind of murder mystery that you don't often see in teen fiction. It has taken the heart of a classic, introducing a new generation to the genius of Holmes, but sets it in a contemporary setting with witty, mouthy, curious teens who aren't afraid to get their hands a little dirty. 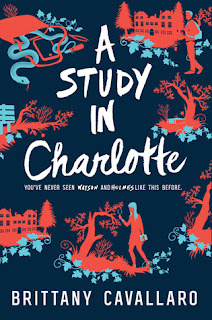 Jamie Watson is likable enough that you forgive the hostile force that is Charlotte Holmes. And Charlotte Holmes is tortured enough to keep things interesting. Adults play the fool a little bit too often for my liking, but that isn't uncommon when you have teen detectives, and character development falls just short trying to match up so closely with its inspiration. Overall, a very satisfying outing with characters that I want to see grow. There are more murders to be solved and lives to be saved. As long as Watson can keep Holmes sober and on point, this could be a very interesting series indeed.